I have finally picked up my Thaw story and added the next chapter. I am making some modifications to previous chapters based on recent revelations I hope will improve the plot. You can read any previous chapter of Thaw or go directly to Chapter Four: Descent. I am also working on a new story that has the potential to be a series (if I ever get serious about writing and spend more than two hours every five months doing it). It is called The Sensitives and is set in turn of the 19th century east coast area. A group of people have been gathered to resolve cases of hauntings. It is a combination of Nancy Drew/Hardy Boys detective work, supernatural abilities with a dash of voodoo, and a lot of character development (at least, one can hope). I have to get a bit more into the plotline and do a few revisions before I share it, but I do have a good feeling about it. 🙂 I may even ask for some character drawing commissions! Makes it so much more fun when you can actually see your characters. One of the final places my brother and sister-in-law wished to see before leaving Europe was Prague. We had difficulty acquiring transportation, so we had a trying time finding our way in the Czech Republic. The language is not the easiest to read… we finally arrived at our hotel around 2 a.m. Despite our short stay, we did enjoy it. We left around 9 a.m. to see the castle, a unique and large structure. 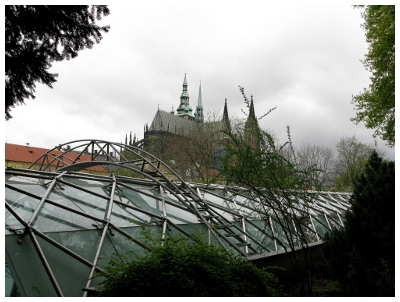 The gardens boasted a variety of trees and a view of the most identifiable cathedral inside the castle grounds. The castle itself is like a small city built in many eras of European architecture. Like a lego castle, really. The view of the city was the best. Castle cathedral from castle gardens. 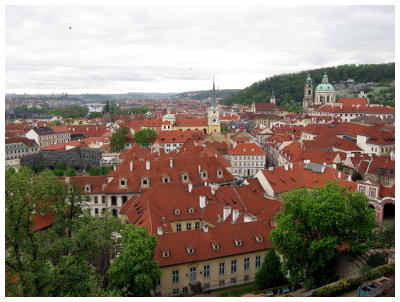 View of Prague from the castle. 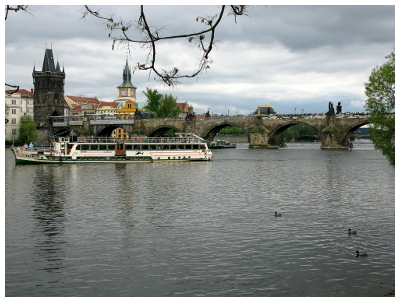 We made our way through the shopping area along the riverside towards one of Prague’s famous bridges, Charles Bridge. Unbeknownst to me, Prague is a fantastic city for shopping. We did buy a colorful glass vase and a leather purse for me, but I wish we could have spent much more time to leisurely shop. Once to the bridge, we continued to shop at the artisan booths along the way. We amused ourselves with some of the architecture on our way to the Hard Rock Cafe (we have quite a vast collection of the glasses now), a new restaurant there (only a few weeks open). Afterwards, we walked through a market in a cozy plaza, then walked around the old Jewish quarter. It is mostly shops now (a lot of chandeliers and jewelry), but many synagogues and small signs of the World War II treatment of Jews were still visible. 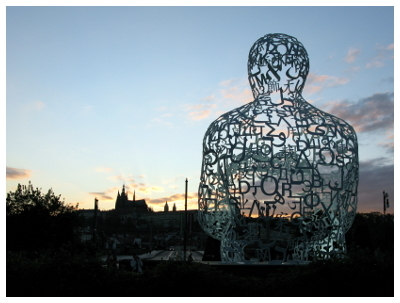 Monument in front of opera house with castle in sunset.